This quick recipe for apricot preserves would be perfect as a sauce for pancakes, ice cream, waffles, cake, yogurt and so much more! It literally took 15 minutes from start to finish. 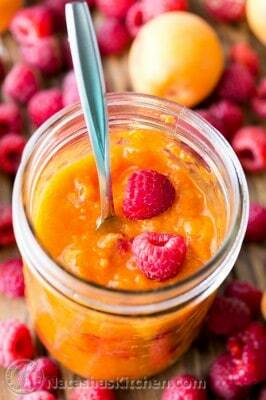 The apricots maintain some of their chunky texture and the raspberries add a sweet tang and beautiful pop of color. P.S because this is a refrigerator jam, you don't have to add a crazy amount of sugar, just 1/3 cup for a pound of apricots. It's just delicious! In the bowl of a food processor add: pitted apricots, 1 tsp lemon juice and 1/3 cup sugar and pulse several times or until the apricots are coarsely chopped. Transfer the apricot mixture to the stove and lightly boil over medium heat, uncovered for 10 minutes, stirring occasionally to prevent scorching. Add more sugar to taste depending on how sweet your apricots were. Add 1/2 cup raspberries and simmer another 1-2 minutes or until raspberries are heated through and softened. Set aside to cool to room temperature then cover and refrigerate until ready to use. Lasts at least a week in the refrigerator.